Our dental implant dentist, Dr. Nazarian, uses the latest dental technology to accurately place your dental implants and improve your smile. Below is a breakdown of ourdental implant procedureso you’ll know what to expect before your procedure. Keep reading to learn more about our dental implant process to see how we can help you. The first step toward getting dental implants is an evaluation with Dr. Nazarian. Once he reviews your 3D scan images, he will establish whether you are a good candidate for implants or if you will first require a bone grafting procedure. Using advanced computer software, Dr. Nazarian will thoroughly explain the implant procedure and answer any questions or concerns regarding dental implant treatment. Next, Dr. Nazarian will use CoDiagnostix software to virtually plan your dental implant surgery. This revolutionary system allows him to use the 3D images of your mouth to plan every step of the procedure, whether you need one implant or multiple. With this information, he will determine the precise placement of your dental implants and create a surgical guide. On the day of surgery, our dental implant dentist will use the surgical guide to drill to the proper depths and angles so the implants are accurate. The guide takes the guesswork out of dental implant surgery and shortens the treatment time. Once preparation is complete, Dr. Nazarian will place the dental implants and confirm the fixation with an Osstell meter. Patients experience little to no postoperative discomfort thanks to these advances in technology. After your dental implant procedure is finished, Dr. Nazarian will go over your post-op instructions. In most cases, an immediate temporary crown will be placed on the dental implant. Depending on the quality of bone, the dental implant will need 3-6 months to fully heal and integrate with the jaw bone. Once the implant is fully healed, we will use the Osstell meter once more to confirm osseointegration and secure your new replacement teeth. 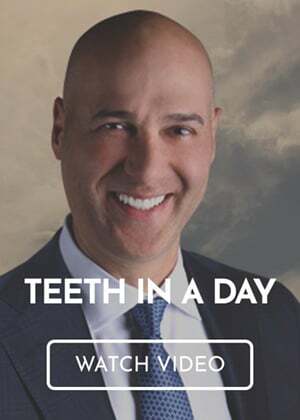 Our Troy, MI dental implant dentist wants you to have a smile you can be proud of, and dental implants are a great way to get there. To request an appointment with our dental implant dentist, call Premier Dental Center at (248) 457-0500.